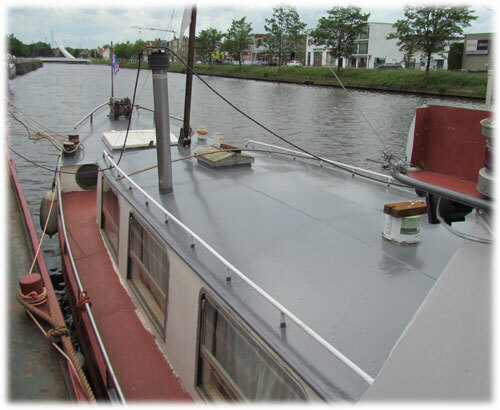 28th June 2012 – I finished one side of the hull of the Hornblower. She looks like it should be. 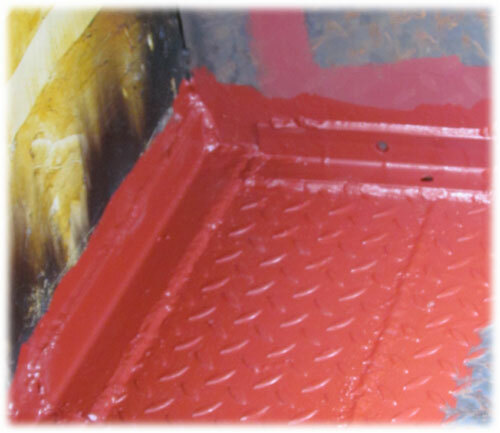 26th June 2012 – I started painting one side of the ship. I will use gray, black and dark green. It is just an experiment. If it doesn’t look good, I’m going for another colour. 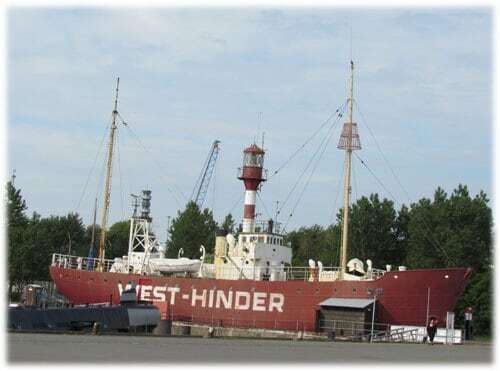 26th June 2012 – A couple asked me to have a look at a wooden ship and the options of restoring her. He had just bought it without realizing the condition it was in. The word salvage would be more appropriate then restoration. I wouldn’t know where to start. 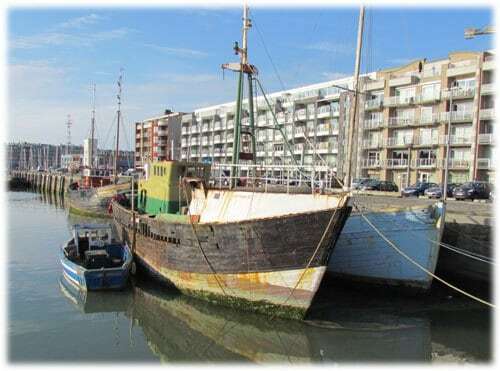 While I was there, and after having a drink with them, I found some older fishing boats in wood. All of them I’ve known when I lived in Ostend as a kid. Nice to see them back! 24th June 2012 – The weather is not good at all. When there was no rain, I started cutting up my last metal plate. I want to finish the bulkhead of the engine room. In the late evening, I made a little experiment with green paint. I have a look tomorrow to see if it is successfully and looking nice. 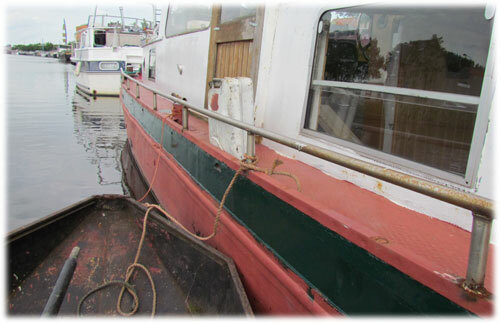 23rd June 2012 – I finally finished the top bit of the bulkhead between the bedroom and the wheelhouse. It took some to get the curve, bend the metal and weld everything to a solid construction. 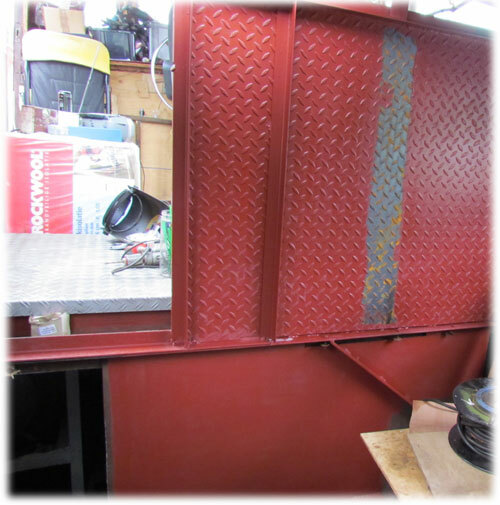 20th June 2012 – The wall or bulkhead is nearly finished. I cut the last pieces of metal and started welding them. 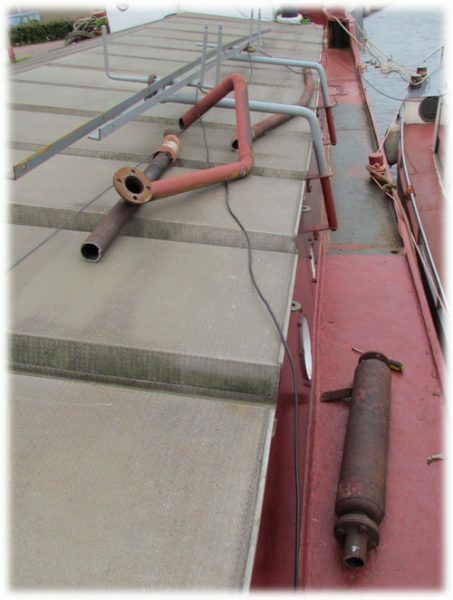 Welding on a partly converted boat, which is full of tools, covers, wood and dust is always a risk. I was very carefully after last month’s fire in the engine room. It took me some time to get a result since I had to bend a small plate over a short distance. Using enough clamps is helping! 19th June 2012 – With the little time I had today, I managed to drill a few holes for the framework of the bedroom. I have to keep moving the ballast all the time. I knew when I got it, it was to early. At the other hand it was free and I had to take it then. I lowered the wooden frame of the bed to see how much space i’m loosing. It seems to be acceptable. 18th June 2012 – I’m still struggling with the bed. I decided to make a wooden frame with the same dimensions of a normal bed. It gives me then a real impression on the size and the room space. The normal trick i’m using is chalking the bed or furniture on the floor. Only this time, I can’t. There is to much stuff laying around. 16th June 2012 – The hardest room for planning is the bedroom. It is a small area, there are a lot of technical issues and I have no idea how to design it. The biggest issue is the size of the bed. I want to build a normal sized bed. I removed some of the previous made paneling. I will turn the bed in the other direction. 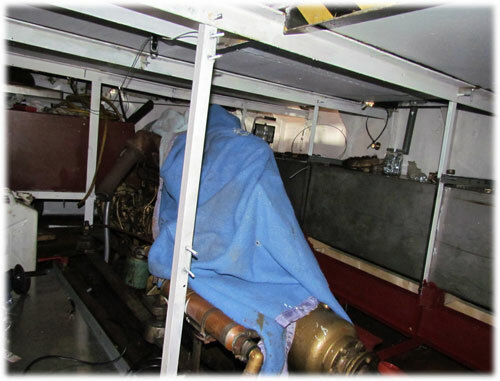 15th June 2012 – The wheelhouse floor must keep the smell and fumes out from the engine room underneath it. It’s just welding meters and meters of L-shape on the floor and the side of the cabin. The exhaust for the engine is still leaking. I want to put a water cooled exhaust to have less noise and smoke. It took me a few hours to cut up the old one and take it from underneath the bedroom floor. I discovered three holes in the pipes and two more in the silencer. In the late afternoon, I got bored of engine room work and welding. I took some gray paint I had left from the Watergeus and painted the roof bits of the Hornblower. 12th June 2012 – I’ve started raising the fuel tanks. I dropped them in the engine room a month ago. I should have made the supports before lowering them, something I really regret now! It took me all day to create a solution. 9th June 2012 – Sill busy. I’m working on several projects at the same time, helping people around. I’m still updating the pages of the Watergeus. 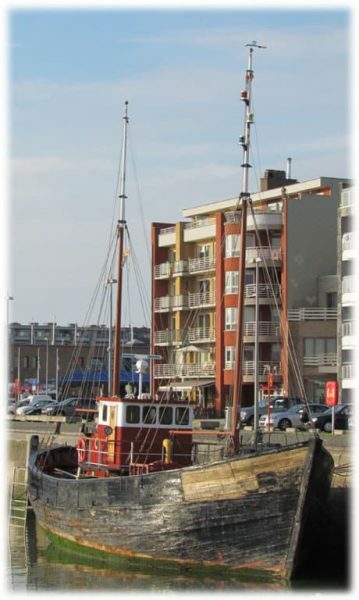 Today I went to Oosterhout, helping a friend sorting out his new yacht. It’s an eighties built yacht with a classic look. 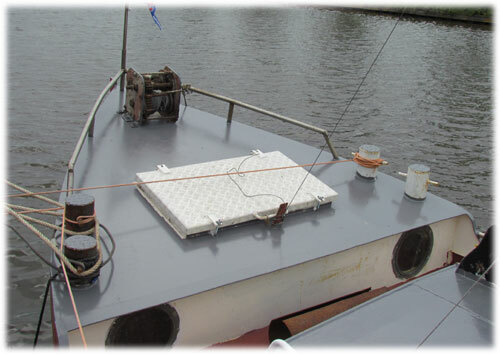 Metal hull and a wooden top construction.